BOWLING GREEN, Ky. — September 21, 2013--Corvettes may be the best thing on four wheels, but what about our two-wheel friends? Starting on Saturday, September 21, the National Corvette Museum presents a unique exhibit featuring over 40 amazing motorcycles of various makes, models and eras. 1966 Bridgestone Special Racer 175cc (on loan from Phil Wheeler) This is the original motorcycle that won the 1966 Daytona Sportsman 200 Road Race, confirming Bridgestone as a threat to the BIG FOUR (Honda, Yamaha, Suzuki and Kawasaki). This motorcycle was ridden by Dwayne Williams who was victorious over at least 23 contenders of various manufacturers. The winner of this race gained bragging rights as having the best motorcycle built in speed and endurance. Most authorities agree that only 150 SR175 racers were ever produced and less than 10% of those remain today. Pratt & Miller Motus MST-R, developed with Corvette ties (on loan from Lee Conn, Motus Motorcycles) The Motus MST/MST-R has ties to GM&apos;s Factory Corvette, Cadillac, Daytona Prototype, Camaro and NASCAR efforts as it was developed with the help of Pratt & Miller Engineering. This bike features 1 1650cc liquid-cooled V4 185HP engine, electronic fuel injection and throttle control, a 720w alternator, Ohlins suspensions and many other innovative and attractive features. 1967 Triumph Bonneville T120R, world land speed record holder in 1966 (on loan from Keith Bemerer) Named the “World Landspeed Record Holder” in 1966 when two Triumph engines were strapped together and raced at Bonneville Salt Flats, UT. Triumph started production on the “Bonneville,” bike in 1959. This particular motorcycle was purchased in 1968 and has been in the Bemerer family since. 1928 Indian 101 (on loan from Brent Askins) The Scout 101 was one of the fastest and most popular bikes of its time. Today it is one of the most collectible. A true barn find from the summer of 2011, the bike has never been painted or restored cosmetically, but is mechanically sound and is ridden regularly. The barn this prize was found in held a variety of bikes, mostly antique scooters. Another wooden building on the property held many cars, including four Corvettes - a ’63, ‘62, ‘58 and a prized ‘54. “At the National Corvette Museum, we strive to bring new and innovative exhibits to our facility. While our main focus is and will always be the Corvette, America’s Sports Car, we love shaking things up a bit and introducing something new to our visitors,” said NCM Executive Director, Wendell Strode. “No two visits to the Museum are the same, and with exhibits like this featuring motorcycles, we hope to bring in folks who might not have otherwise visited. 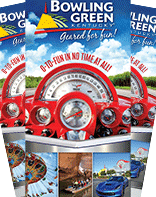 This exposes them to the Corvette lifestyle and creates new enthusiasts,” Strode added. The Museum will continue to welcome motorcycles in 2014 with the grand opening of the Motorsports Park. The Park is currently under construction and plans to host events not only for Corvettes, but also motorcycles and other model cars. For more information on this project, please visit the NCM Motorsports Park website. This exhibit will run from Saturday, September 21, 2013 through Friday, January 3, 2014. 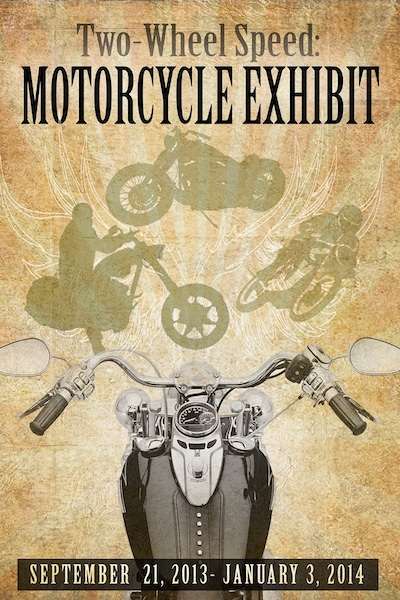 For more information on this exhibit and a peak at a few of the bikes on display, please visit our website. Since 1953 the Corvette has been America&apos;s Sports Car. The National Corvette Museum was established as a 501(c)3 not-for-profit foundation with a mission of celebrating the invention of the Corvette; preserving its past, present and future; and educating the public about Corvette. The National Corvette Museum is open daily from 8 a.m. to 5 p.m. CT. The Museum is located at Exit 28 off I-65 in Bowling Green, KY.
For more information on the National Corvette Museum, visit our website at: http://www.corvettemuseum.org or call (800) 53-VETTE (83883). Information provided by the National Corvette Museum.